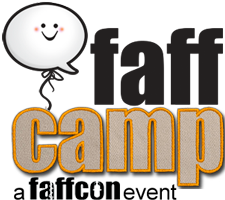 FaffCamp is scheduled to be held in San Antonio, TX on March 19-22, 2014. We’re holding registration for Faff Camp II Kickstarter-style: we only have until July 10th at 11:59 p.m. Pacific Time to reach our attendance and hotel reservation targets. If we fall short of the break-even point, we’ll send everyone a refund and, sadlyâ€¦no Faff Camp. But we don’t think that’s the way it’s going to goâ€“not if we all pull together and make it happen! To register for FaffCamp II click here soon!!!!! !